It's just about the best combination of price and performance in an SSD. 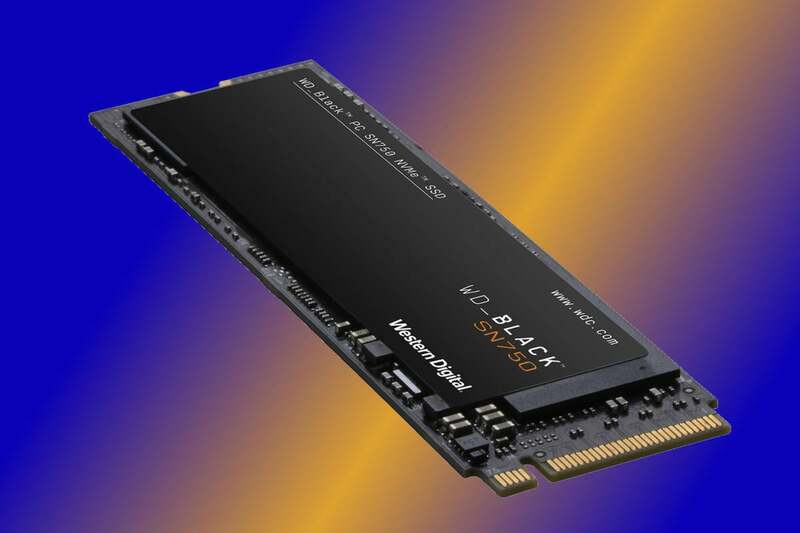 The WD Black NVMe SN750 is an SSD aimed at the gaming community. As you might guess from the name, it’s close cousin to the stellar WD Black NVMe SSD, which rivals the Samsung 970 Pro in performance and beats the pants off of it in price. The SN750 version merely cements that status. If it has the corollary effect of lowering the price on the original, which remains a very good SSD, so much the better. 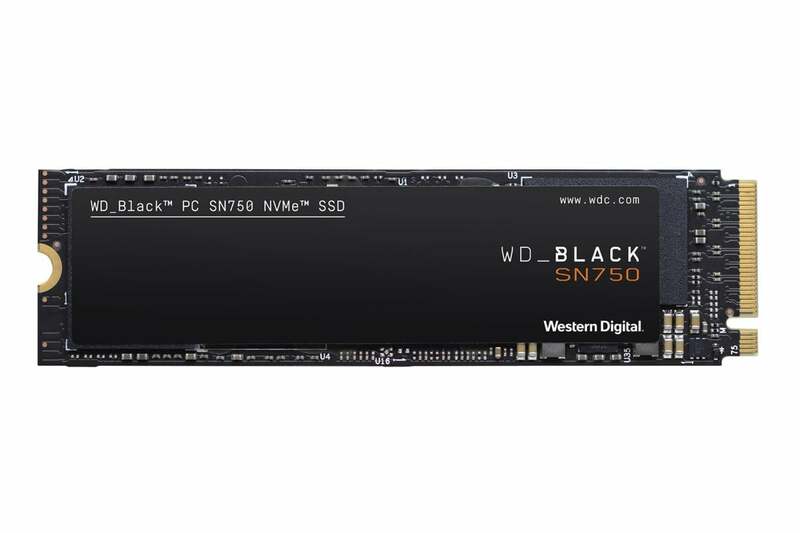 The WD Black SN750 is an M.2, x4 PCIe, NVMe SSD that ships in the 2280 (22 mm wide, 80 mm long) form factor. Make sure you have the appropriate slot for it on your desktop or laptop’s motherboard. Note that there are M.2 slots that support only SATA, and that not all PCs support booting from NVMe. Check your user’s guide to see if you’re worthy. The WD Black SN750 NVMe Gaming SSD is a real bargain. The SN750 uses 64-layer 3D (stacked, vertical, etc.) NAND with 3 bits per cell—in other words, TLC (Triple Level Cell). There’s also 256MB of DRAM cache for every 250GB of capacity. WD is a bit reluctant to talk about exactly what’s going on with the in-NAND caching (so are all the other vendors). I don’t blame WD for keeping mum given that the company is doing it better for less that anyone else. But it is smart and sustains performance on long writes, which most TLC-based drives do not. The SN750 ships in 250GB ($100 on AmazonRemove non-product link), 500GB ($150 on AmazonRemove non-product link), 1TB (the capacity we tested, $300 on Amazon), and the 2TB upcoming in February ($400 on AmazonRemove non-product link). These flavors put the WD Black SN750 SSD in the same price range as Samsung’s new 970 EVO Plus, though the latter’s 2TB version isn’t due until later this year. The SN750 carries a five-year warranty, and the drives are rated for 200TBW (TeraBytes Written) for every 250GB of capacity. That means the company expects that you’ll be able to write that many terabytes to the drive before cells start wearing out and can’t be replaced by the spares on board. Note that most of the industry estimates are extremely pessimistic, and the average user is highly unlikely to write that amount of data even in ten years. The drive will also ship in a couple of months in a version with a heat spreader that you may use if you so decide. It's unlikely that most users will stress the drive that hard, except perhaps during heavy gaming, a pastime which was mentioned heavily in the info WD sent me about the drive. 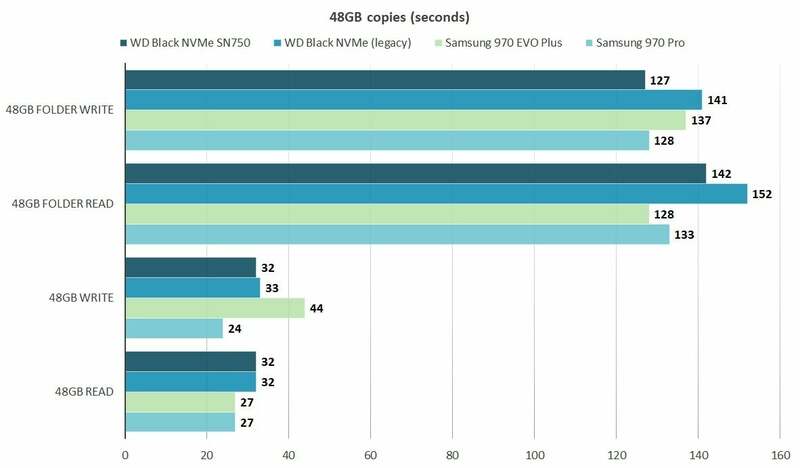 The WD Black SN750 NVMe SSD is noticeably faster than the older, plain Black NVMe SSD, which was already a very fast SSD. Noticeable via benchmarks, at any rate—good luck trying to tell NVMe SSDs apart with the naked eye, except when transferring large amounts of data. CrystalDiskMark 6 (below) showed improved sustained reading and writing for the SN750 (dark blue bars). A 200MBps improvement in sequential write speed is nothing to sneeze at, though most of the SN750’s improvement are with queued small files. It’s not as fast as the 970 Pro, but has closed the gap significantly. WD really beefed up the queued small file performance (when many files are written simultaneously), but normal small write performance from a single app is slightly slower. That means for most users, small file performance will be slightly slower. On the bright side, it’s already so fast, you’ll never notice. Though it can’t match the pure pace of the more expensive Samsung 970 Pro, the SN750 does quite well overall, with substantially improved performance when lots of threads are employed. That unfortunately, doesn’t happen much with end users, and there was a slight drop in single-thread 4K writes. The SN750 knocked 10-plus seconds off the older NVMe Black’s 48GB copy times. It was also a hair faster than Samsung’s new 970 EVO Plus, though it couldn’t match that drive reading the single large file. 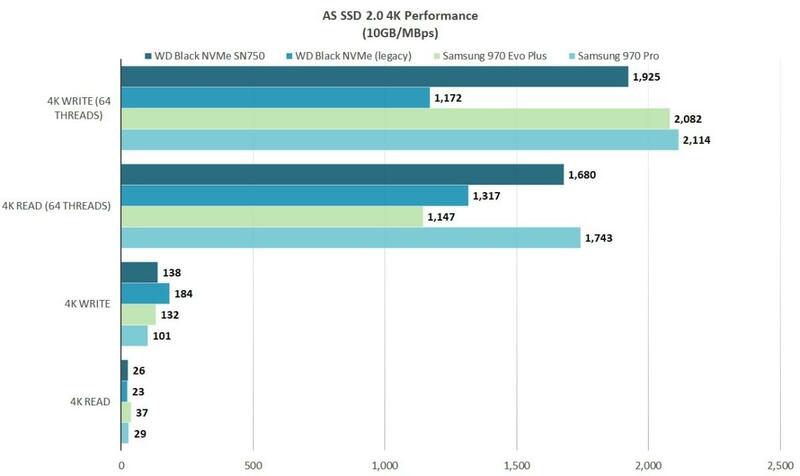 The WD Black SN750 is faster than the older "plain" Black, and comes close to matching the Samsung 970 Pro in everything except large file performance. Note how the 48GB write time of the Samsung 970 EVO Plus (500GB capacity) is well off the pace. That’s because it ran out of cache about halfway through the write and dropped to 850MBps. But notice that the 970 EVO Plus’s write time for that same single large file is far slower. It ran out of cache, at which point sustained write pace dropped to around 850MBps. The 970 EVO Plus shown was the 500GB version; the 1TB version would run out of cache later in the process, however, this illustrates a weakness of most TLC drives. WD has somehow managed to work around this issue—the SN750 maintained its approximately 1.45GBps transfer rate throughout a much larger 450GB copy. All told, the SN750 has closed the performance gap with the Samsung 970 Pro to the point where it hardly matters except for bragging rights. That said, the 970 Pro is still the creme de la creme. Note: We tested the 1TB version of the SN750. The 250GB and 500GB capacities won’t offer the same performance. In fact, that 250GB version, because of fewer NAND chips and data pathways, is rated for about half the write speed. The WD Black SN750 NVMe SSD is a nice improvement on the older version, though that latter remains a very worthy drive. It’s a hair slower during everyday use than the Samsung 970 EVO Plus, but you’ll never notice the difference. You will notice when the EVO Plus’s sustained write speed drops. For that reason, I’d opt for the SN750. Note: This article was amended 2/4/2019 to correct the information about the heatsink/spreader which will only be available in a separate SKU in a couple of months. 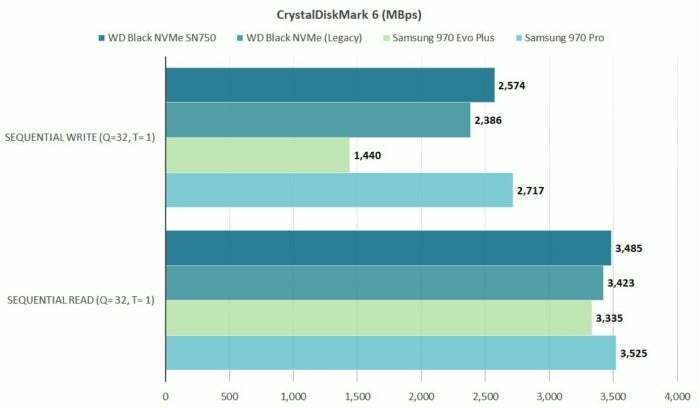 This story, "WD Black SN750 NVMe SSD review: Faster than ever, and still a fantastic bargain" was originally published by PCWorld. Almost as fast as Samsung's 970 Pro, but costing the same as the 970 EVO, WD's Black SN750 NVMe SSD is just about the best combination of price and performance on the market. That's about all there is to say.